Bikaner was one of the Rajput kingdoms of Rajasthan which existed in sixteenth century India in the modern north-west of the country. The Rajputs were Hindu warrior clans, and the word 'rajput' itself literally means 'the son of the king', with the people being known for their valour. This particular state was centred around the city of Bikaner, with its territories lying in the north-west of the modern state of Rajasthan. It was a region of wilderness until Rao Bika established a city there in the late fifteenth century. There were a number of small Rajput kingdoms which emerged between the sixth to thirteenth centuries, including Amer, Bundi, Jaisalmer, Jodhpur, Malwa, Kannauj, Mewar, and all were eventually conquered by the Moghuls. Born 1438. Of the Rathore clan and founder of Bikaner. Rao Bika is a member of the Rathore clan and is the son of Rao Jodha of Jodhpur. 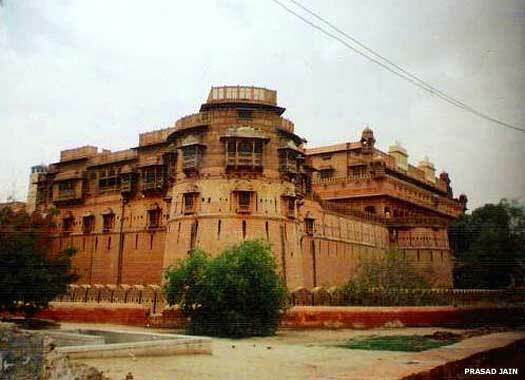 Following a disagreement with his father he leaves Jodhpur and founds the city of Bikaner after building his fort, Rati Ghati, on the site. He ends the rivalry between his clan and the Bati clan by marrying the daughter of their ruler. When refused the family heirlooms (the sandalwood throne, 'Pugal', plus an umbrella, a sword, and a horse) by his brothers, he marches to Fort Mehrangarh and subdues his brothers. He does not harm them, simply regaining his rightful property. During his reign he also subdues the Jats, Pathans, Bilochis, and Kyamkhanis and annexes their territory to his kingdom. He eventually dies at his fort. Son. Lost control over some of his nobles. Rao Lunkaranji succeeds Naroji and subdues the rebelling nobles. He later defeats a Moghul army under Prince Kamran, but dies in battle against the nawab of Narnaul. Brother. Married the daughter of the ruler of Mewar. Jait Singhji defeats the Bidwats, Chahals,and Johiyas, and expands the kingdom's territory by taking portions of Marwar. He is subsequently killed in battle by Marwar's forces under Rao Maldev. Kalyan Singh is forced to flee his kingdom by the forces of Marwar, but he soon recovers it from Rao Maldev thanks to the help of Sher Shah Suri. He also resists an onslaught by the Moghul emperor, Akbar. The Moghul emperor, Akbar, gains the submission of Bikaner, along with the other Rajputs of Bundi, Jaisalmer, and Jodhpur. Son. Subdued Jodhpur. Died in the Deccan at Burhanpur. Raj Singh marries the princess of Jaisalmer, and later becomes Emperor Akbar's general. His own daughter is married to Prince Salim, son of Akbar (and later the Moghul Emperor Jehangir). On his deathbed, Raj Singh passes over Dalpat in favour of his younger brother, Sur Singh. Dalpat rebels and declares himself king. Son. Usurped the throne. Served as a commander in Moghul army. Sur Singh takes his brother prisoner and seizes his throne. Dalpat Singh is killed at Ajmer while trying to escape from captivity. Differences have arisen between the king of Golconda and the Moghul governor of the Deccan, Emperor Shah Jahan's son, Aurangzeb. Aurangzeb's own son is Prince Muhammed, and he is deputed to attack Golconda. Anup Singh, son of Raja Karan Singh, aids him, winning the fort of Golconda. A war of succession erupts when Moghul Emperor Shah Jahan falls ill. With Karan Singh as one of his supporters, Aurangzeb defeats Dara Shukoh in battle using a mixture of guile and bravery and subsequently seizes power. Karan Singh's later reward is to be deposed by Aurangzeb for dereliction of duty at Attock. He is exiled to Aurangabad in the Deccan, where he dies. Son. Died at Adoni in Deccan. Son. Succeeded aged 9. Died of smallpox at Adoni. Brother? Succeeded aged 10. Broke off ties with declining Moghuls. Sujan Singh assists Emperor Aurangzeb in the Deccan, and successfully wards off attacks from Jodhpur and Nagaur. Once it becomes clear that Moghul power is fading, Sujan Singh breaks off ties (and Moghul control). Wars against Marwar are triggered when Abhai Singh of Marwar attacks Bikaner. The capital is saved through the intervention of Raja Sawai Jai Singh II of Jaipur, although Zorawar Singh has to quell rebellions by his own nobles. Maharaja Gaj Singh makes peace with Marwar against the wishes of his nobles. He is also the first of his line to mint his own coins. Son. Reigned for 13 days. Son. Succeeded aged 6. Died same year, perhaps killed by uncle. Uncle, and regent during Pratap's short reign. Surat Singh's reign is one of mixed fortunes. He resolves border disputes with Jaipur, and concedes the payment of indemnity to the Marathas after their attack, incurring huge debts in the process. He later applies for British protection after an internal rebellion. Narendra Ratan Singh supplies camels to the British in India during their Afghan campaign. The British in India annexe Sindh in 1844, and the Sikhs attack British divisions at Ferozepur. The First Anglo-Sikh War is triggered in 1845. The Sikhs fight well, but eventually succumb to the disciplined British army following betrayals by some of their Dogra generals. Narendra Ratan Singh supplies help to the British for this campaign. The Indian Mutiny (or Great Sepoy Rebellion) against British rule erupts among East India Company native army units at Meerut, near Delhi, but after some hard fighting in places it is suppressed, with Sardar Singh providing support. The British Parliament places India under the direct control of the empire's Viceroys. Adopted son. Succeeded aged 18. Dungar Singh is the first to introduce electricity to Rajasthan. he also sets up a police force, a hospital and a modern administrative system. Sir Ganga Singh accompanies the British army in its campaign into China. He later proves to be an excellent administrator like his brother and ushers in an economic revolution complete with judicial system, banking system, a boosted infrastructure, and public utility works. Son. Born 1902. Acceded to the Indian union.